We give Allah (God) praise and thanks for His mercy, His grace and His goodness to all of the members of the human family. We thank Him for all of His prophets and messengers; that according to the teachings of the Holy Qur’an: He has sent a messenger to every nation. We thank Him for His intervention in our affairs in the Person of Master Fard Muhammad, The Great Mahdi (or “Guide”) that we believe and know that the whole world has been looking for, Who didn’t stop in the East—He came from the East as it was written: “As lightning shines from the east even unto the west, so shall the coming of the Son of Man be.” Such a One came among us, and for three years and four months found and taught the Honorable Elijah Muhammad—and I could never thank Allah enough for such a magnificent teacher. It is he who we celebrate today, for it is he who is the founder of this Class (The M.G.T. and G.C.C. ); and I thank Allah for being His student, to represent one whose shoelaces I am unworthy to untie, the Honorable Elijah Muhammad. To Sister Student National M.G.T. Captain Sandy Muhammad, and to all of you who presented today such a beautiful and seamless program: If I had a vest on, all the buttons on my vest would have been busted by now! (Smile). 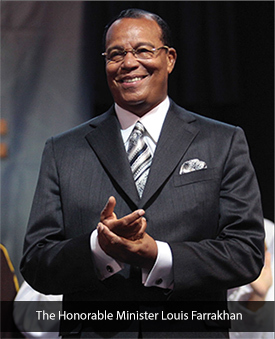 … On so many occasions, tears came from my eyes as I looked at you, as I listened to you, and as I thought of him who taught me and taught us, the Honorable Elijah Muhammad. How proud he is to see you marching forward, as Muslim Women and Girls, to show the world what a righteous woman looks like. And when we say “The Black Woman”: We know that the Black woman is the first woman on our planet; she’s the mother of all living, and this is why they call [the first woman] “Eve” (and when they bring pictures of Eve, she’s a woman of color). So we start here with us, because we have been destroyed by our enemies. But this Teaching is for all women, not just for Black women but for all women. So when I was watching the presentations, I said, “This video must go out to the world,” because what the Honorable Elijah Muhammad was given by Master Fard Muhammad belongs to the whole world. It starts with us, but it must go out to the entire world. A ruler was coming to the Earth that would create mischief and cause the shedding of blood, and the angels were, kind of not “upset,” but they’re questioning God: “Why are You going to allow this?” His answer to them was “I know what you know not.” Now, “mischief” and “the shedding of blood” is an evil thing, but the Bible, Romans 8:28, puts it like this: “All things work for good for those who love The Lord and who are called according to His purpose.” So even though a “time,” a “season,” was going to be given to the rule of wickedness, that it would not be “permanent”; but in that season, every soul would be touched by the Satanic mind that would rule in that season. The Honorable Elijah Muhammad taught us that we, The Original People, “make History” before we live it. We see it and we write it 25,000 years in advance. So he taught us that in the Year “One” of this present 25,000-Year Cycle, a Man was seen coming to birth in the Year 8,400 of this Present Cycle—a Man named Yakub; and that Man would bring in a civilization the like of which has never been seen before: an unrighteous civilization. So when we, The Original People of the Earth, knew that an enemy was coming who would rule, we then set about to hide the wisdom of our ancient civilizations so that when the wicked one came, he could not borrow from our ancient wisdom to build his world; he would have to build it from himself. So during that period, the ancient civilizations of The Original People of our planet, the Indigenous people (the natural people to our planet) was buried under jungles, under sand, under water. … So that when the enemy came, the only thing they saw that reminded them that there was civilization—that this one is a “baby” to—we left The Pyramids and The Sphinx for the new man to see. When they saw it, they called it the “First Wonder” of this present world. The Sphinx is a lion; in Arabic, it is called Abu al-Hôl (“The Father of Everything”). And that lion had the face of a Black man, with broad nose and thick lips, to let you know that you, Black man and woman, are not a “Johnny-come-lately,” but you are The Original Builders of every great civilization! It started from you. But guess what? Not only were we then to hide our wisdom and civilization, the woman—who carries The Secret of God—would have to be “called in” to be protected from this new creature that was coming who would, in his heart and mind, seek to destroy the moral character of women all over the Earth. Understand that everything that you see in creation is the work of man and woman. I’m going to say it again: Woman, you are no “little thing,” you are very big in The Eyes of God. So let’s see “who” are you. Point No. 1: He created you from a single being. Not from any “rib”! And men have used that, in an ugly way, to show a woman as being “crooked,” “bent” (you know, like a “rib” as in “I’m going to throw that out today.”) Allah (God) created you from a single being… (Write down the word “single” and the word “being,” and then go look these words up.) When something is “single,” it is “one, and one alone.” “Being” means “the essential nature of something.” It is “being,” it’s alive, it’s present. So God created man from a single (“one-of-a-kind,” “only one”); and in the nature of that being is the “fundamental”—it’s the essence of what a “man” is. Well, “Who” could that be? When we say, Qul huwa Allahu ahad (“Say He Allah is One”): If the man was created from a single essence, or single being, or a single person, that Person is God Himself. Point No. 2: Then, God says from that single being He created its mate of the same essence. So the woman is created from the same essence that man was created from; and the essence that man was created from is God, so the essence that the woman was created from is God too. That’s why I was so pleased when I heard the sister say “we are not the woman of man, we are the woman of God.” Ask yourself: “Well, when did this take place?” The Honorable Elijah Muhammad taught us that God is “Self-Created.” He doesn’t have a “mommy” or “daddy.” He created Himself. Wow! So if He is “Self- Created”: He looked within Himself and found you, and out of Himself He created wo(mb)-man. How great are you to be The Second Self of God? I don’t want such talk to make you think that The Class is a “science class.” This is Science; but what I am trying to get you to see is that everything that is in Creation, you had a hand in it. Not “some” things, everything. You are from The Lord of The Worlds. In the Book of Judges Chapter 14, verse 18, when Sampson said, “If you had not plowed with my heifer you never would have learned the secret of my riddle,” it’s trying to tell you that the secret of “man” is in a woman. And if you want to get to a man and destroy a man, you have to go through who? A woman. So we had to hide you to protect ourselves. So when we hear that a woman “should stay in the house,” and you “should not do this or that,” understand that this was protection for the civilization of God that was already in you; because once that was destroyed, we are gone. Women, you are made to look up to God since you came from God. 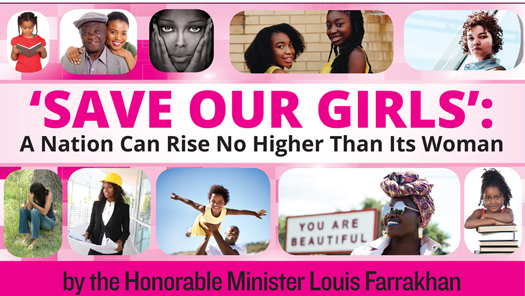 The Honorable Elijah Muhammad taught me that the woman’s nature is to equal herself up to man, or up to God; so whatever “God’ is, you’re going to be striving to be equal to Him. That’s how great you are, and that’s how great your potential is! So for 6,000 years the woman has been suppressed, and in most civilizations, the women have been oppressed. And right now all over the earth, women are rising: Rising against the mistreatment of women by men who do not understand the nature and value of a woman. So, for these last 6,000 years, women have been under men who did not value them. I say to Muslim sisters, my beautiful Muslim sisters: Islam needs reform. And the reformation in Islam is around the female. Have you seen the movie Yentl? It’s an old movie, wherein Barbara Streisand had to play like she was a boy in order to get instruction in religion (Judaism); because in the religion, “religious instruction” was denied the women. In Islam, today, women stay home, and men at the mosque; and in some societies which we have visited, women are treated in a manner that would make a woman think she is less than what she really is! … Now the end of Satan’s rule has come, and you notice they are finding civilizations under the sea, in the forests; down in Central and South America, they’re digging great civilizations from The Maya, from The Inca, and various Indigenous groups. And now the women all over the planet are rising against oppression from men. We don’t like to see men abusing women. In our society, any man that strikes a woman, he gets time out of our society for 90 days; and if he does it again, he might get more time—and if he does it again, he might get a whoopin’ from The F.O.I. I’m saying that to say this: Even though, sisters, you fight men who want to exercise a degree of righteous control, the Bible teaches you that “Christ is the head of man,” “man is the head of woman,” and “woman is the head of children”—I want you to see that we’re not just “making something up,” this is real! And now, we have to figure out how we’re going to do it right. In 1 Corinthians, Chapter 11, verses 8-9, Paul says: “For the man is not of the woman: but the woman [is] of the man. Neither was the man created for the woman; but the woman for the man.” This is The Plan of God! And in The Qur’an, man is called khalifah meaning “one who stands in the place of God by God’s Permission.” So, the woman stands beside him (as a ruler); man is made for The Glory of God, and woman is the glory of man. The potential of The Woman of God includes a good home life, creativity reflective of high civilization. Now it is the time for the woman to come up out of confinement. It’s time for the female to glorify God in the greatness of “who” she is. The Qur’an says, in Surah 33, verses 35-36: “The believing man, the believing woman,” “the charitable man, the charitable woman,” “the fasting man, the fasting woman”; and, “the praying man, the praying woman”—so you are his equal in all these things. And what the enemy has done: He broke your man; and in breaking the man, he uplifted you in an un-natural way. Who is going to college? You. The man’s on the corner. The man’s in jail. Sisters want to be lawyers, sisters want to be doctors. And the more beautiful you are, the more tragic it is; because you’re beautiful, and you tend to your beauty. How much money do you pay for your hair? But you don’t know how to cook? “I don’t … Who wants to learn how to cook—that’s for them old-time women like my grandma!” But grandma could keep a man. So, if you love him, you want to keep him: The way you keep him is through those 7 Training Units that the sisters were demonstrating. But it doesn’t mean you’re going to be relegated forever to “the home,” but that is your base… What kind of “lawyer” are you, lawyer, and you don’t have a good home life? What kind of “doctor” are you if you don’t have a good home life? What kind of “preacher” are you, sister, if you don’t have a good home life? So the home is your “base,” and that is why when I was coming up many, many years ago, women had to be trained in “home economics.” But today that’s not taught in the schools, so you don’t know how to “make a home”; you know how to show men the beauty of your form. Men love it, they want it; then they make you pregnant. And guess what? You lose the form, you lose the man—because the man only wanted what you gave him! And you end up with a baby, with no man… Don’t you think it’s time for that kind of foolishness and misuse of you to stop? Sisters, what are you capable of doing? The Honorable Elijah Muhammad says a woman can do anything that a man does. And the only thing he forbids the woman to do is the thing that degrades her. … So, sisters: You should learn how to sew. In The Nation of Islam, the sisters had sewing classes; and my wife would sometimes stay up days with the machine making garments. And I mean when they stepped out: They were a fashion model—not by the freaks of Paris and Rome, and New York. But, you are creative women. Create things that you would love to see yourself in that covers you, but displays you as a highly-civilized woman! So, “how high” can you go? As high as you want to! Why would God allow the female to wear His Attributes if you can’t be a manifestation of that Attribute? Women: You’ve got to be set free! What God has put within you must be cultivated, must be developed, and must be used for the advancement of a Nation and a World. So that’s the message of Elijah Muhammad for The M.G.T.—and The F.O.I. My dear sisters: A new world is to come into existence from you.